River’s End Campground is a great park in an excellent location. It’s only about 1/2 mile to the beach and about 15 miles from historic Savannah. It makes for a convenient base to explore coastal Georgia. River’s End campground is clean, well maintained and the staff was friendly. Interior roads are paved and the campsites are gravel. They have tenting sites, water and electric sites, and full hookup sites including cable. They also have camping cabins. There’s plenty of shade here… with large oak trees scattered throughout the park. River’s End campground offers complementary wifi via several hotspots throughout the park. Wifi coverage was pretty good from our site, but if you need a dependable signal I suggest that you inquire about sites near the hotspots. 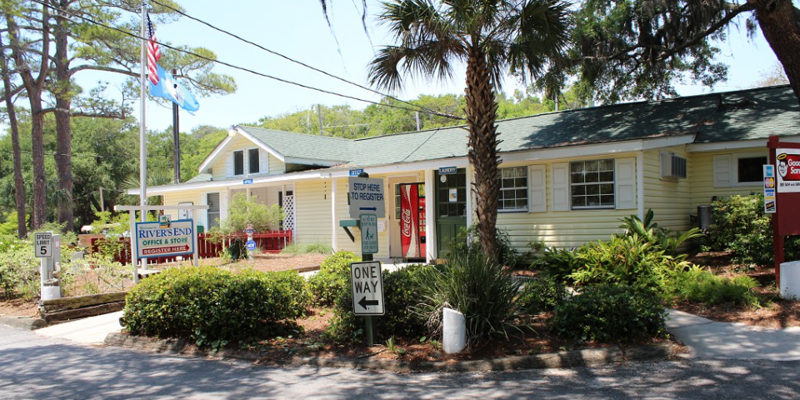 Amenities include gift shop and well stocked general store, clean restrooms, a large swimming pool (seasonal) and a self-service laundry room that is open 24 hours a day. They also have a community pavilion, two dog parks, a fitness center and a very cozy TV Lounge with two televisions, tables and chairs, a book exchange and board games available for park guest use. Prices are reasonable for the area. We paid about $55 a night for a full hookup site, peak season rates for the same site would be about $90. If you’re headed down I-95, you might want to consider River’s End campground as a overnight stop or to spend a few days. It’s about 25 miles east of I-95, exit 99.